Meet our wild neighbors! 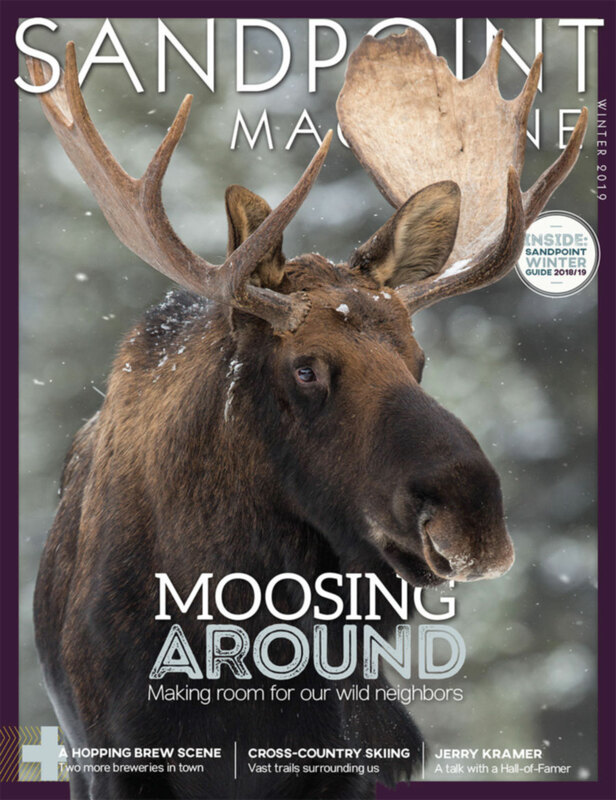 Sandpoint, it can be said, is where the wild things are, and you can read about a few of those wild things in our Winter 2019 issue! Learn about the MOOSE we see all the time, in town and out … and about the far more surreptitious WILY WEASELS. Then go on to discover SIGNIFICANT MOMENTS in Sandpoint’s history; the return of the region’s native language; the ‘miracle’ on Pine Street; and a group of Sandpoint retailers who are SURVIVING AND THRIVING downtown. Plus… don’t miss stories on Sandpoint’s HOPPING GROWTH as a craft beer town, the search for SEARS CATALOG HOMES, and an interview with Sandpoint’s newly minted Hall of Famer, JERRY KRAMER. It’s all right here, plus more, in our flip-page edition. In the face of the flames. 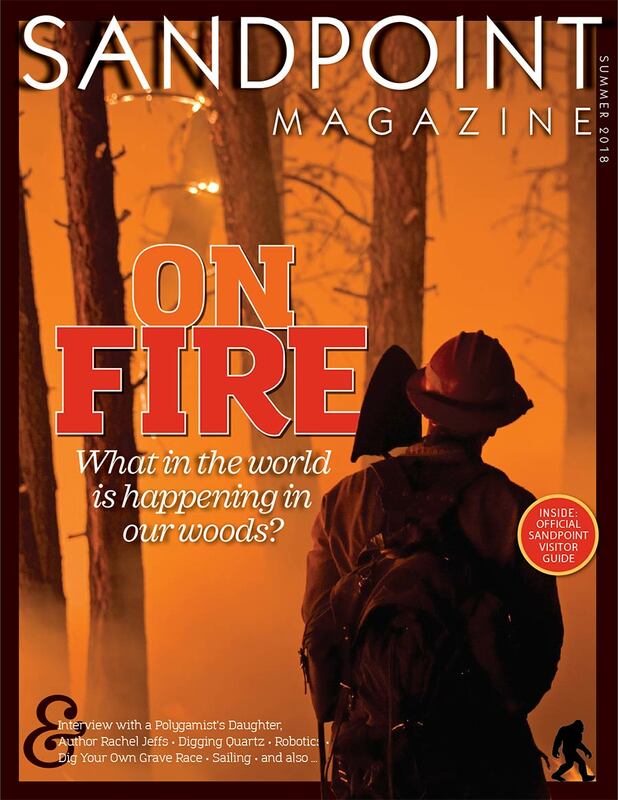 This summer, Sandpoint Magazine is on fire, with substantive information on our area’s increased wildland fire risk, the men who fight it, and related issues. In addition, learn about quartz hunting at Solo Creek, an introduction to sailing, the last stand for area caribou, an ultimately challenging footrace, and the most elusive creature in our woods… Sasquatch! Plus, don’t miss stories on vacation rentals, beautiful gardens, and author Rachel Jeffs, who grew up in a notorious polygamous cult and has now found freedom… and a new life… in Bonners Ferry. All that, and more, in our flip-page edition right here. Wintertime extremes. 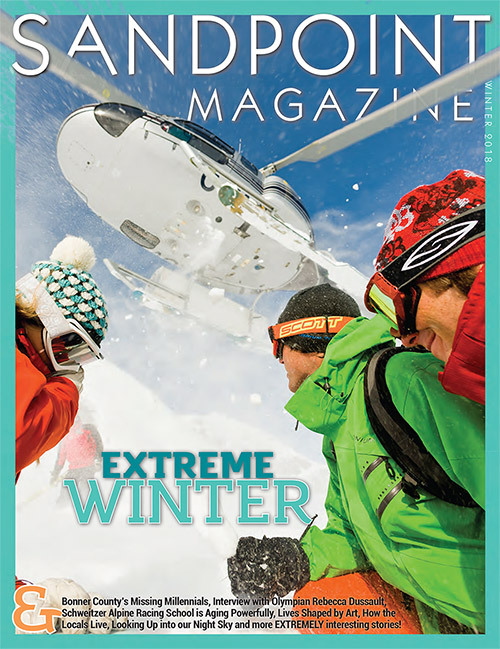 This winter, Sandpoint Magazine gets out there … or at least, our contributors do, with stories on the new heliskiing operations from Selkirk Powder Company, a tag-along with some extreme snowshoers, a drop-in to a backcountry cabin, our local youth skiers with SARS racing club, and at the other end of the spectrum the Prime Timers skiers … and so much more. Little boats, big adventures. 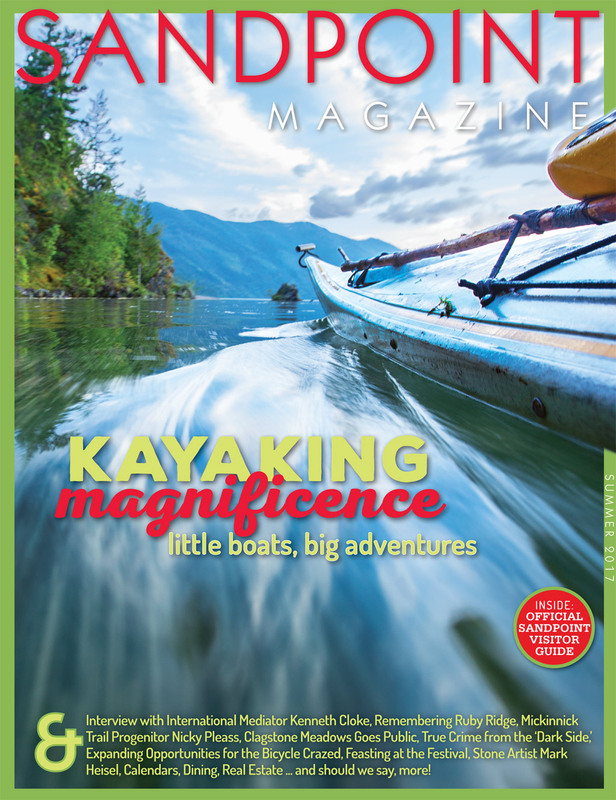 This summer, Sandpoint Magazine paddles full-speed into the kayaking boom on big ol’ Lake Pend Oreille, with the story of a kayak adventure around the entire 111-mile shoreline. 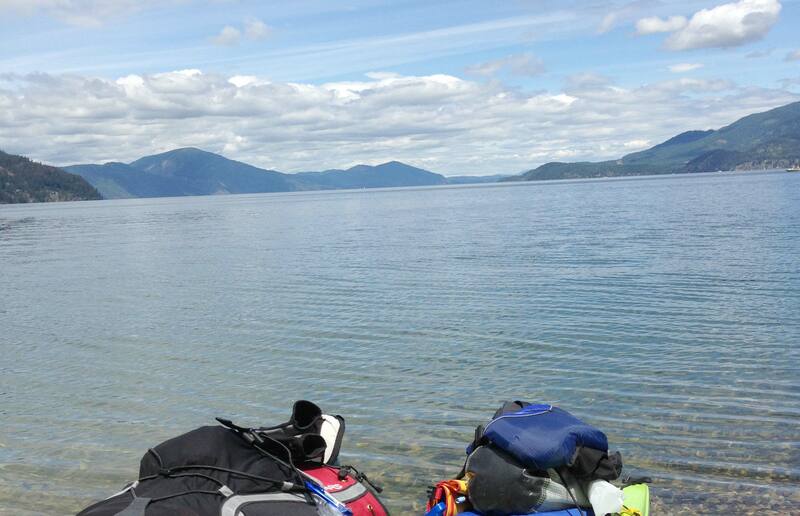 Plus a map to great launch points, and a bonus adventure on down the mighty Pend Oreille River. And … mountain biking and hiking; an octogenarian adventuress, Nicky Pleass; and even adventures in art with stone artist Mark Heisel and “Whinny Nicker Neigh” artist Shellby Young. Ready to get your adventure on? Click to read it. 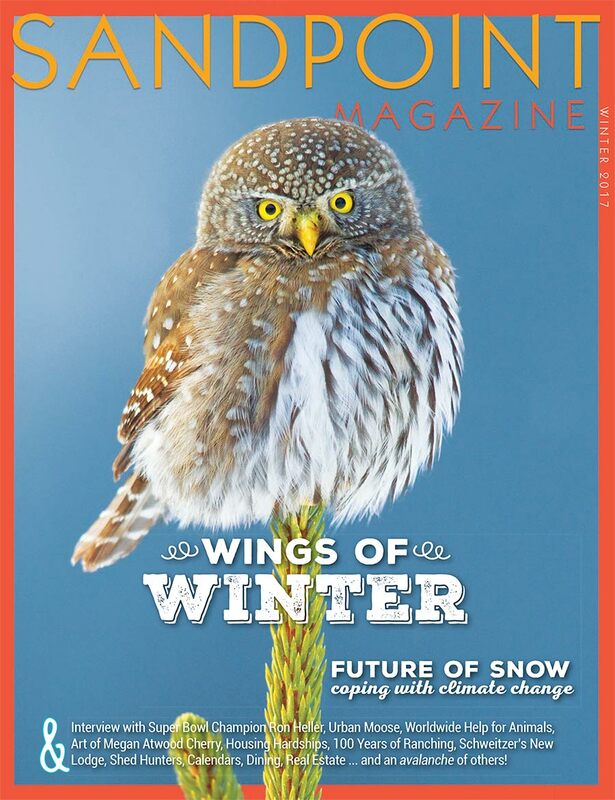 Here’s an issue to make you flutter, especially if you adore our feathered friends whooo join us each year for the snowy season. Check our photo-rich guide to winter birding in North Idaho. And for more wildness, read about urban moose plus the folks who search the woods for elk, deer and moose sheds. And there is an avalanche of other stories to read by the fire. Stories explore the effects of climate change and what it means for our winters; the new summit lodge at Schweitzer; and a fond farewell to the Schweitzer Wang Shack. There’s an introduction to the sport of snow biking, up-close interview with Clark Fork native and Super Bowl Champ Ron Heller, and a peek at the artwork of Megan Atwood Cherry. All that and … yes … more: Real estate, dining, lodging, things to do. Click to read it! Sandpoint has gone to the DOGS. 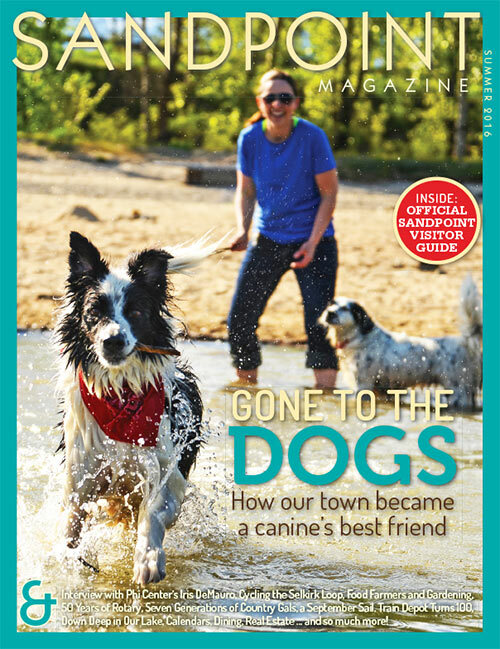 Yep, this issue is all about how our town is becoming a dog’s best friend. Explore Sandpoint’s dog-loving culture and meet some distinctive local dogs with fascinating stories. Plus check out the Sandpoint Ambassadog contest – and enter your own favorite canine to become Sandpoint’s official spokesdog. Of course, that’s not all. Learn the history behind local peaks, how the Idaho Community Foundation is powered locally, the splendid satisfactions of sailing, super secret hiking spots, and what surprises lie deep down in our big lake. Meet organic farmers, the Phi Center’s charismatic Iris DeMauro, sculptor Steve Gevurtz, photographer Marsha Lutz, and seven generations of country gals. Read the history of Sandpoint’s 100-year-old railroad depot, and go bicycling on the International Selkirk Loop. And more: Real estate, dining, lodging, things to do … all in our town’s flagship magazine. If you think Sandpoint Magazine’s been around awhile, you’re right. 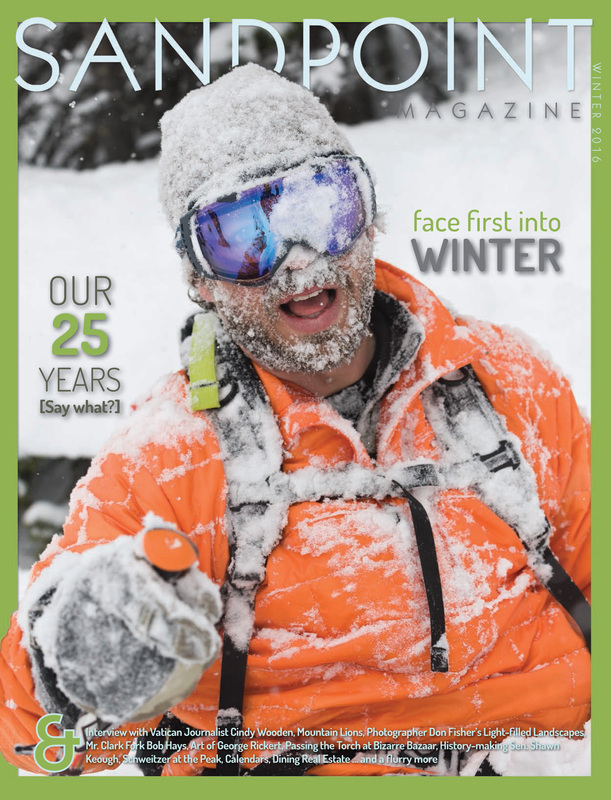 The Winter 2016 issue marks our 25th anniversary! For our silver anniversary, we take a stroll down memory lane with 25 for our 25th — highlights from 25 favorite stories. With a couple thousand stories published, choosing just 25 wasn’t easy! Of course, that’s not all. We delve into the season with a veritable exposé on Winter, the season that defines us and, frankly, occasionally denies us. Also out-of-doors, we explore skiing with Panhandle Backcountry plus the ski life at Schweitzer. We interview journalist Cindy Wooden, Sandpoint’s Vatican and Pope Francis connection. And there’s much more: mountain lions, art, fab photography, a history-making senator, theater and Mr. Clark Fork. To mention a few. Now, go read it! 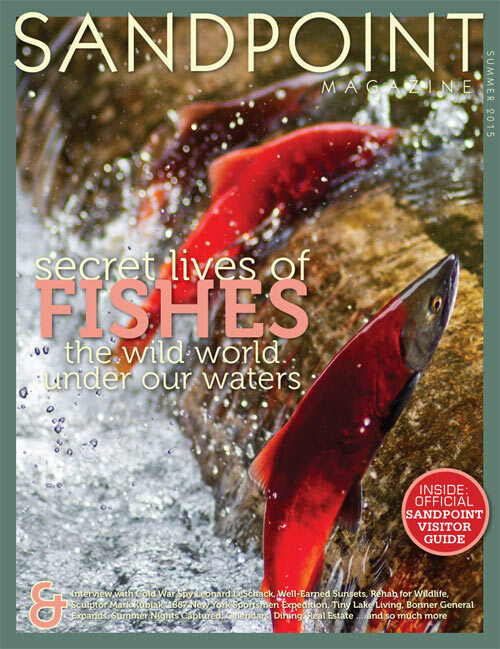 Uncovering the mysteries of the deep, Sandpoint Magazine reveals the secret lives of fishes in our waters – from the mighty Gerrard Kamloops rainbow trout to the bizarre-looking burbot. 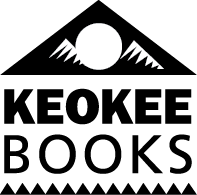 Read about kokanee and other famous fish of Lake Pend Oreille, sturgeon and burbot hanging in the balance in Kootenai River, and warmwater imports, not to mention excellent essays on furred and feathered fishers and crick fishing. Also in this issue: world photography by Alan Barber … sculptor Mark Kubiak’s open-air museum … diary of 1887 New York sportsmen on expedition to Priest Lake … Bonner General Health’s expansion … Bonners Ferry, a town in transformation … an interview with Cold War spy Leonard LeSchack … a sensational Summer Nights photo essay… sunset hikes … and more. Hooray for summer! 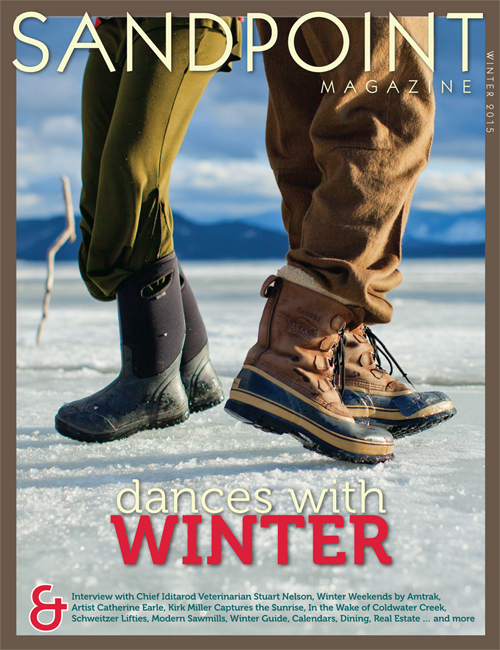 You needn’t be a local Sandpointer to get the whimsy of our Dances with Winter cover, with boot-clad celebrants doing a happy dance on frozen Lake Pend Oreille. But as our Winter Dance cover story describes, the season brings a multitude of SSTD* once the snow falls and waters begin to freeze. Also in this issue: Visual treats from artist Catherine Earle … Schweitzer Lifties live the dream … Kirk Miller’s fantastic sunrise photography … the sawmill revolution that technology hath wrought … Sages of the Skies, profiling two aviators … an interview with Iditarod Chief Veterinarian Stuart Nelson … a terrific winter wildlife photo essay … riding the rails, Amtrak style … in Coldwater Creek’s wake … and so much more. Winter’s here. Time to put on your dancing’ Sorels! 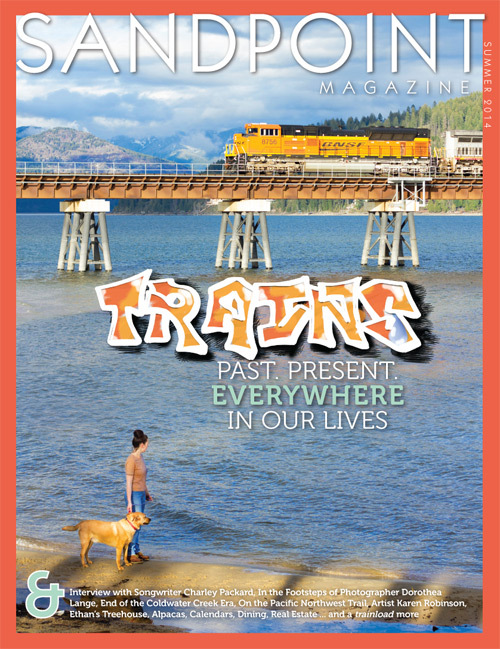 Trains seem ever-present around Sandpoint – and in fact, they have been since our town’s very beginning. Ever since the first tracks were laid here in 1882 with the sweat of Chinese laborers, trains have provided industry, transport and a soundtrack to our lives. With traffic increasing due to coal and oil transport, trains are poised to be an even larger presence. Get aboard, for our exclusive package of stories on the trains in our lives. Plus: An interview with beloved singer-songwriter Charley Packard … following in the photographic footsteps of Dorothea Lange … Ethan and His Fantastic Treehouse … Quest Aircaft soars … Coldwater Creek goes dry … and a veritable trainload more!